La Rambla by Catalunya opens at IFC Mall in Hong Kong. Hong Kong — Launched in 2012, Catalunya established itself as Hong Kong’s leading Mediterranean dining destination serving innovative Spanish cuisine. In November, they will be opening a new concept, ‘La Rambla by Catalunya’ at ifc mall. Spanning over 5,000 sq. 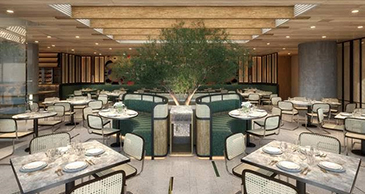 ft., La Rambla will extend the legacy of its predecessor and offer contemporary interpretations of Spanish flavours in the heart of Hong Kong. The kitchen, helmed by Spanish chef Ferran Tadeo, formerly of Minibar by José Andrés and also el Bulli, will offer an ingredient-driven, Catalan-inspired menu that reflects his creativity and mastery of modern cooking techniques. With an unwavering eye on quality, the La Rambla team is committed to sourcing the freshest ingredients possible. Seasonal seafood not only from Spain, but other parts of Europe and Japan are flown in twice a week offering guests the opportunity to sample produce in its best possible condition, prepared with integrity. These include red prawns from Palamós (just north of Barcelona) and ‘pepino de mar’, a Spanish version of local Hong Kong delicacy, sea cucumbers. Chef Carles Tejedor, owner of Lomo Alto, Barcelona’s top steakhouse Carles Tejedor, will be directly sending a 90-day and 120-day aged Galician beef to La Rambla, a first for Asia. The attention to detail also extends to the bar programme. La Rambla will serve such classics as dry martinis and gin tonics, two cocktails synonymous with Barcelona’s drink culture. With a focus on quality rather than theatrics, the drinks will be based on iconic recipes. A gin trolley will roam the dining room and bar offering over 30 varieties of gins and more than 10 types of tonics. La Rambla will also recreate el Bulli’s signature white “Sangria in Suspension”, a refreshing molecular cocktail with suspended fruit and mint leaves. For oenophiles, wine director Marie-Paule Herman, another el Bulli veteran and Hong Kong’s Amber, will offer a curated selection of fine wines housed in Sub-Zero wine fridges. While the indoor space can welcome up to 100 diners, the outdoor terrace has been redesigned with a custom-made wooden deck and separate bar. Destined to become the go-to destination to enjoy postcard-worthy views of Hong Kong’s iconic harbour, the outdoor terrace will seat up to 100 guests and feature designer pieces from Kettal, a Barcelona-based manufacturer of outdoor furniture.